The shape of the head allows the bristles to surround each tooth for individual cleaning. Penetrates hard to reach areas. Indicator bristles fade as a sign to replace your toothbrush head for a better clean (about every 3 months). Dentists recommend replacing your toothbrush head about every 3-4 months, or when bristles are faded and worn. Compatible with the entire lineup of Oral-B rechargeable electric toothbrush handles, except for Oral-B Sonic toothbrushes. Oral-B #1 brand used by dentists worldwide. 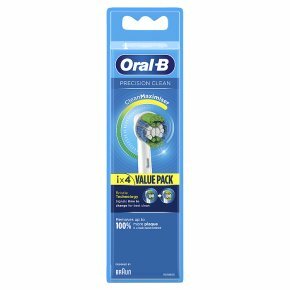 The Oral-B Precision Clean replacement electric toothbrush head bristles reach deep between teeth and cover more surface, leaving your whole mouth cleaner than a regular manual and power away up to 100% more plaque for a superior clean vs. a regular manual toothbrush. The brush heads in this refill pack are compatible with Oral-B Genius 8000, 9000. Compatible with Oral-B PRO 600, 650, 1000, 2000, 2500, 3000, 4000, 4900, 5000, 6000, 6500, 7000. Compatible with all Oral-B Vitality and Vitality Plus Variants. Each order comes with 4x Oral-B Precision Clean Electric Replacement Toothbrush Heads.